In February I wrote that anti-gun leftists were outgunning gun rights supporters in Annapolis. That by identifying candidates and helping to elect candidates that share their position, groups like Moms Demand were outflanking gun rights supporters who did not have an organized effort to do the same. Ultimately, it didn’t work the way they thought it was going to work. The long gun bill was ultimately not passed. But amusingly, the ire of the anti-gun lobby has been focused on Senate Judicial Proceedings Committee Chairman Bobby Zirkin. The General Assembly expired and, thanks to Senator Zirkin, we still don’t have background checks on long gun sales. It’s hilarious to see the anti-gun lobby accusing Bobby Zirkin, the same Bobby Zirkin who was one of the lead sponsors of the disastrous Firearms Safety Act of 2013, of caving to gun rights advocates. The same Bobby Zirkin who said “everybody is in agreement as to what we should do” regarding regulating long guns. The fact is that the bill passed both Houses of the General Assembly. There were differences between the House bill and the Senate bill, and there was not an agreement between the two houses about the bill. Is that Bobby Zirkin’s fault? Not specifically, considering all of the other Democrats voted for the amended version of the bill on Third Reader. So did Bobby Zirkin “slow-play” the House bill? 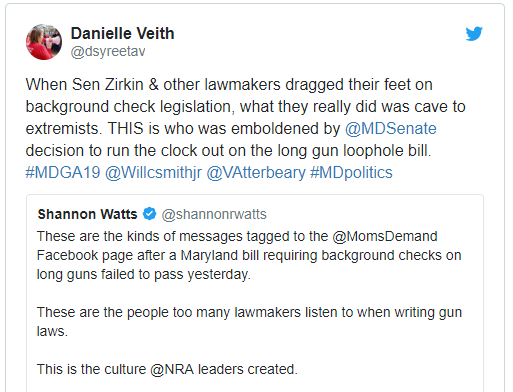 Annapolis insiders say that he didn’t slow-play the bill because of anything gun rights advocates did, but it had everything to do with being angry with the House and he was slow-playing a lot of the House bills coming through Judicial Proceedings. But Zirkin may also realize that when the Firearms Safety Act of 2013 passed that Democrats, himself included, assured everybody that they would not come for the long guns and they would not go “too far” in passing anti-gun legislation. Gun rights advocates knew this was a crock, but considering that Democrats made that promise barely six years ago, and considering that the House legislation was an extremely radical piece of legislation, there was never a chance that Zirkin was going to pass the bill exactly like the anti-gun lobby wanted him too. Zirkin was in a no-win situation. The response of Moms Demand was to do what likes of astroturf groups with a national focus funded by out of state special interest money do in times like this: explode in absolute rage at one person who did something they didn’t like while forgetting that they need that person’s support to accomplish their goals next year. After the temper tantrum from Moms Demand, why would Bobby Zirkin do a thing to help them in the future? There’s a saying in the professional wrestling world, working yourself into a shoot. In the parlance of professional wrestling, it’s when something is scripted (a work) but things get a little too real and one of the participants start fighting or arguing for real (a shoot). And by attacking Bobby Zirkin for not being their errand boy in exactly the way they want them to be and for ascribing motives to Zirkin that truly do not exist, Moms Demand may have worked themselves into a shoot in such a way that they get none of the gun-related legislation they want for the foreseeable future.